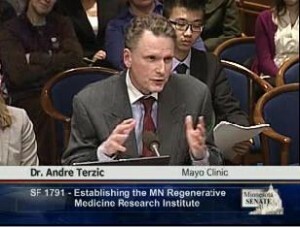 Regenerative medicine recently got a boost in Minnesota, and Mayo Clinic is among the institutions that will benefit. During the 2014 Minnesota legislative session the legislature passed, and Governor Mark Dayton signed, legislation including funding for a regenerative medicine collaboration with the University of Minnesota. The new initiative will receive $4.5 million in funding from the State of Minnesota this year and $4.35 million in subsequent years to support regenerative medicine research, clinical translation and commercialization efforts. Additionally, the regenerative medicine initiative will include representatives from private industry and others with expertise in in these areas that are not affiliated with the University or Mayo Clinic. “Through this event, the state of Minnesota is essentially embracing regenerative medicine and surgery as the future of health care,” says Andre Terzic, M.D., Ph.D., director of Mayo Clinic’s Center for Regenerative Medicine. A: Regenerative medicine and surgery uses the body’s ability to restore structure and function. At Mayo Clinic, the Center for Regenerative Medicine is addressing the root causes of diseases, injuries and congenital anomalies by using the body’s natural ability to heal itself (rejuvenation), delivering cells or cell products to diseased tissues or organs to restore function (regeneration), and using healthy cells, tissues or organs from a living or deceased donor to replace damaged ones (replacement). A: While Mayo Clinic will work closely with the University to establish a process going forward, the intent is to support regenerative medicine research, clinical translation, and commercialization efforts in Minnesota. There is great promise in this field of medicine, and we have a unique opportunity to leverage the strengths of institutions like the University of Minnesota and Mayo Clinic to position Minnesota more competitively. Q: What does the investment in regenerative medicine mean for the state of Minnesota? A: Support for regenerative medicine from the state will not only help advance the science, but will position our state more competitively and demonstrate that this field of medicine is a priority. The new law will place Minnesota among several other states that have backed such research with state funds. Using regenerative medicine, we are creating new therapies that we believe will lead to innovative and definitive solutions for our patients. We also believe that we can open new economic opportunities through commercialization of technologies as the field evolves. Q: What was it like being part of the legislative process/testifying? A: It was gratifying to see the legislative interest and commitment to regenerative medicine. I have a strong appreciation for the work and choices that our elected officials make on a daily basis. We are pleased that creating and providing funding for this new initiative between Mayo Clinic and the University was included in the end. The opportunity to provide testimony enabled me to share the promise of regenerative medicine, answer very good and thoughtful questions, and witness great interest and support for the work we are doing and the work we will do with the University with the passage of this bill.